Mjukvara för att separera tal och bakgrundsljud. Separera, isolera eller ta bort melodier, sång, tal eller dialog från fullständiga mono- eller stereomixer. Snabbare processering, förbättrad separationskvalitet och fler spektrala redigeringsfunktioner jämfört med TRAX 3 SP. För Post Production, Radio etc. Stand Alone. Endast Mac. Molnbaserad licens, internetanslutning krävs. 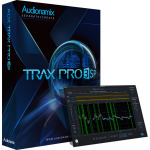 TRAX Pro SP introduces a speech-optimized separation algorithm which automatically detects and separates speech, allowing you to extract or remove dialogue from background elements. TRAX Pro SP also includes a new automatic consonants detection feature to help maintain the clarity of the separated voice. We’ve also expanded the lower pitch range on separations to improve the performance of the software on deeper voices. – Internet connection is required for license activation and cloud-based separation processing.